Add style to your daily beauty regime with a personalised cosmetic bag. Functional and beautifully made, your personalised makeup bag won't go unnoticed. Design your own makeup bag today to send as a gift to your mum, sister, or even as a little treat for yourself. A second photo can also be added at an extra cost. Spacious and stylish, the customised makeup bag is an ideal addition for any beauty lover to organise their daily essentials. Whether you use a photograph or a pretty pattern, we print your desired image onto smooth satin on one side, or at an added cost we also print a second photo on the other side. To make yours or the recipient's life easier, the zip runs centrally across the top and partially down the sides so access to your lippy or moisturiser is made simple. From the careful printing to the hand-cut fabrics, each personalised makeup bag is created to order in London, UK. Love the cosmetic bag. It is a gift for my friends birthday and it is perfect. The size of the bag is good, for a make up bag. The quality is OK, they warned me that my pics were low quality but it came out OK. The inside of the bag could be improved I think for the money, a little basic, maybe a lining. But this is second time ordering with Bags of Love and would do so again. We only work with the best materials, including fine Italian soft Nappa leather that is carefully selected in four charming colours. Once you hold your personalised make-up pouch, you'll instantly notice its designer feel, especially the satin photo area. The metal heart zipper is a great feature that means even in the dark or if you have to fumble around in your handbag trying to reach your beauty products, you can easily detect the zipper. Because of the compact nature of our custom makeup bag, one can easily fit inside your main daily handbag - perfect for when on-the-go. Who Are Personalised Cosmetic Bags For? Personalised makeup bags are perfect for any cosmetics queen and beauty fanatic who wants to keep their products organised (and away from the eyes of anybody else!). Mums would love to receive this on their birthdays or for Mother's day. You could even fill the customised makeup bag with little pamper treats, as an extra touch. 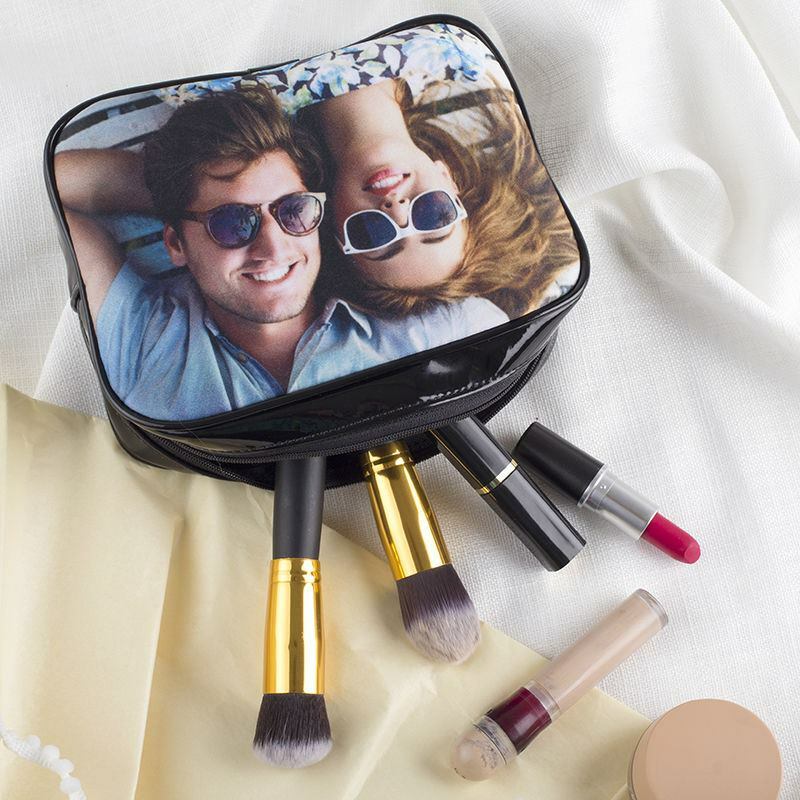 Or if you're tired of seeing your girlfriend's beauty products scattered over the bedroom, a makeup bag customised by you is the ideal way to overcome this without telling her she's messy! Like many of our products, the personalised makeup bag comes with a discount quantity, so buy more than one today and save money. For large or bulk orders please contact our customer service team via webchat. Our technicians expertly print your photo design onto our stunning satin fabric using deep infusion print technology. This modern printing method penetrates eco-friendly inks deep into the fibres of the material, which gives you a long-lasting, high-quality print without changing the surface texture of the fabric, resulting in a make-up bag which is much more flexible, yet just as hardwearing as a makeup box. Our craftsmen then cut the fabric to size and our seamstresses stitch it all together. Once your personalised makeup bags are one complete unit, a metal, heart-shaped charm is added to the zip, before everything is passed over to quality control. They check it over to make sure it is of the high quality that we expect and finally ship it out to you. Whatever vision you have - a photo of you and your girlfriend, your own name in text or a photo collage of you and your best friend - your creative options are endless. Women's makeup bags, in general, are pretty blank and generic, so you can really stand out - and avoid confusion and mix-ups - with a unique photo or pattern that grabs attention for all the right reasons. Whether you create your personalised makeup bag is for daily use or a travel makeup bag for special weekends away, what's certain is that you can use it in a number of ways, such as a toiletry bag, personal care bag, or even to organise your necklaces to prevent them from tangling. Multipurpose, multi-awesome. Keep the special ones in your life close to you at all times with the personalised makeup bag. Print your baby's Christening photo, or your cherished grandparents on their wedding day to remind you of the importance of family. For a unique keepsake for your husband or wife, get hold of your children's nursery/school painting and have that printed onto your bespoke photo makeup bag. It's special as it only has significance to you and your family. Moving away from sentimental, you could go down the comedy road and choose a funny photo of your best friend that will never fail to make her laugh. For your group of friends, you could opt for a star sign theme, with each photo makeup bag personalised with their sign of the zodiac. Whether they believe in it or not, it's a bit of fun!